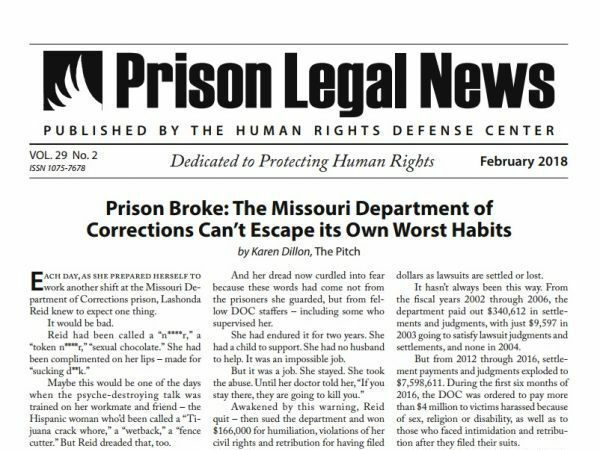 The complaint alleges that inmates who subscribe to Prison Legal News (PLN), a 72-page monthly newsletter that includes news, analysis and legal developments of interest to inmates, were prevented from receiving all or some pages of the publication. Prison Legal News is published by the Human Rights Defense Center, a non-profit that advocates on behalf of incarcerated people in state and federal prisons, according to the organization’s website. Illinois corrections facilities named in the complaint include Big Muddy River Correctional Center, a medium-security prison in Ina, and the Decatur Correctional Center, a minimum-security prison for women, among others. The suit alleges the Decatur prison implemented a “blanket ban” of the newsletter. HRDC also claims prisons prevented inmates from receiving copies of other publications distributed by the nonprofit. The suit claims the alleged censorship violates the HRDC’s First and 14th Amendment rights by improperly banning all or part of its publications and failing to provide adequate notice of the alleged censorship. Founder and executive director of the Human Rights Defense Center, Paul Wright, says the nonprofit never had trouble getting PLN into Illinois prisons until about two years ago. About 200 Illinois inmates subscribe to PLN as of January this year, according to HRDC. Inmates can get a yearly subscription for $30, Wright says. A list of censored publications obtained from IDOC through a Freedom of Information Request includes 10 editions of Prison Legal News under the status “Approved-C” and two editons under “Disapproved.” A spokesperson for IDOC, Lindsey Hess, explained via email that “Approved-C” means the publication is approved but at least one page has been removed due to content, and “Disapproved” indicates the material may be prohibited in some correctional facilities and approved in others. Hess declined to comment on the lawsuit, stating that the department cannot comment on pending litigation. Wright says IDOC has not provided the nonprofit with a justification for the alleged censorship. Hess says a publication can be “disapproved” by a warden at a specific correctional facility but that does not mean it is banned across all state prisons. A book can only be banned statewide by IDOC’s Central Publications Committee and it must be reviewed six times before a ban can be implemented, according to Hess. She says if an inmate receives a publication directly from a publisher at a facility where that material is not allowed, the publisher is notified and given an explanation. The publisher then has 21 days from the date of the notice to file an objection and submit a written supportive statement or other documentation, Hess says. Alan Mills, executive director for the Chicago-based Uptown People’s Law Center, says PLN isn’t the only publication his organization has fielded state prison censorship complaints about in the last two years. Mills is one of several attorneys representing HRDC in its suit against IDOC. He says HRDC was not notified in certain instances nor given a reason why editions of PLN were prohibited in part or whole from some prisons. Wright says PLN has been banned “at some point or another by about 12 or 14 prison systems” nationwide. The publication reports news and information about prisoners’ rights, legal developments, corruption in prison systems, brutality against and neglect of inmates, among other issues. “There’s not a lot of good news coming out of prisons or jails,” Wright says. HRDC has successfully sued 10 other state prison systems over censorship of their publications, and those lawsuits have resulted in settlements and consent decrees, according to a press release from the nonprofit. The group also filed a suit against the Cook County Jail in June 2016, which is still pending. The lawsuit seeks a stop to alleged censorship of PLN in state prisons in addition to compensation for damages and legal expenses. Illinois Newsroom is a regional journalism collaboration (RJC) focused on expanding coverage of education, state politics, health and the environment. The collaboration includes Illinois Public Media in Urbana, NPR Illinois in Springfield, WSIU in Carbondale, WVIK in the Quad Cities, Tri States Public Radio in Macomb, WTVP in Peoria, the Midwest Center for Investigative Reporting and Harvest Public Media. Funding comes from the stations and grants from the Corporation for Public Broadcasting (CPB) and McCormick Foundation.